These are one of the most valuable scholastic chess awards in the US. Here are all the details by Mark Schein and Aviv Friedman as announced on the US Chess Trust website. Once again the Schein – Friedman Scholastic Recognition Project (with the help of the American Chess Academy) is happy to announce its annual scholarships recipients! First, words of thanks to all the very worthy young players who have applied – once again the choices were not easy ones. The winner of our first place, and a $4000 scholarship is Sam Sevian, from California. 12-year-old Sam’s meteoric rise breezed by records such as the youngest American expert, and later youngest National Master, to a current IM-elect status. His long list of successes has culminated with a gold medal, and a title of a World Champion in the boys under 12 category, in the last World Youth Championships in Slovenia. Texan Jeffery Xiong, and Californian Cameron Wheeler tied for 2nd -3rd and will each receive a scholarship in the amount of $2500. Age 12, Jeffery is the leading player from the Dallas chess club ‘greenhouse’ of young talents. A Senior Master at age 12, among his achievements Jeffery is a former national scholastics champion, and a former silver medallist and world vice champion (tie for first) in the boys under 12 section of the World Youth (Greece, 2010). Cameron, who is a National Master at age 12, holds multi state and national scholastics championship titles. He is twice a top 10 finisher in the World Youth – 5th in Greece, 2010 and a tie for first, with second place and a silver medal in Slovenia, in 2012. The Schein – Friedman project is designed to help some of our younger champions improve and dedicate themselves more to chess, while offsetting the financial expenses that usually come with those. Hopefully the project will reward excelling youngsters, and help them become tomorrow’s best players and Grandmasters. At the same time they would be serving as role models and an inspiration to the entire scholastic community. The American Chess Academy is a non-profit organization, dedicated to “developing strong US chess talent, and exposing the game of chess to as many neighborhood children as possible”. 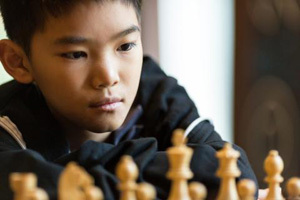 Read Greg on Chess: The State of Young American Chess Talent for thoughts on how programs like the Schein-Friedman Scholarship is growing a strong generation of young players.